This rich, yet low-carb dish is an excellent choice when you want to add the decadence of mashed potatoes to your meal without adding all the carbohydrates. Cauliflower, with its high nutrient levels, high fiber, and low carbs is a healthier pick than potatoes, and preparing them this way will have even the pickiest spud-lover asking for a second helping. Sauté rested garlic over medium heat in 1/4 teaspoon olive oil, safflower oil, butter, or oil spray until soft and caramelized, about 5 minutes. Be careful not to burn the garlic or it will taste bitter. Remove leaves and stem from cauliflower head, chop florets into small pieces. Steam or boil cauliflower in a small amount of water until it is soft enough to poke easily with a fork, about 10 minutes. Remove from heat; drain if necessary. Place garlic and remaining ingredients (parmesan cheese, cream cheese, chicken or vegetable stock, pepper, and salt) in mixer bowl or food processer. Process, mix, or mash with potato masher until cauliflower is desired consistency. 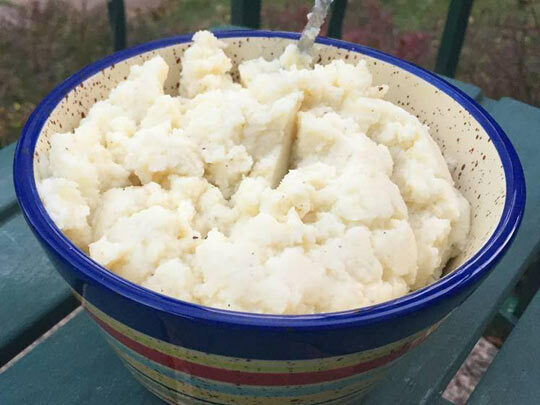 If you are not sure that your family with like this new "mashed potato" recipe, consider adding some mashed cauliflower to your next batch of potatoes and start working the amount of cauliflower up slowly as they get used to it. 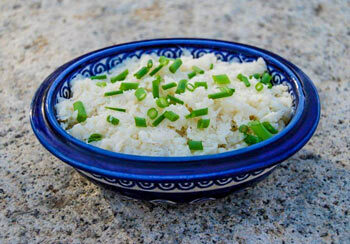 The cauliflower mashers in the picture were made using a Ninja mixer . If you prefer a coarser consistency, like the one in this picture, you can grind it less or use a potato masher.